You have to admire a man with the "cahones" to put a date on his prophecies even if that means becoming a laughingstock. "My Dear Friends, We must warn the world of nuclear wars that will start no later than September 12, 2006. You need to take part in this Last Days Work of Yahweh." 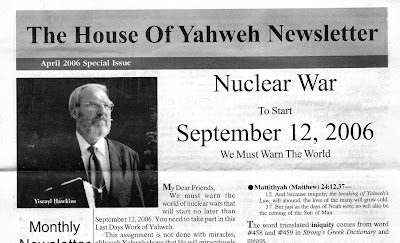 According to their website the House of Yahweh now claims that a "nuclear baby was conceived September 12, 2006 and will be born June 12, 2007," which is an interesting revision of their original claim. It's a life-time prophesy. First the nuclear baby was conceived, soon it will be born. Next, the cute lil thing will be crawling around, then walking, then going to pre-K. Prophecies age so quickly. I actually read the entire newsletter. The newsletters were at every door of an apartment complex in Longview, Texas. Kind of hoping that this nuclear war will happen in the few hours that we have left. I just hate this era of human history. Much of the social economic progress that made in the past few decades is starting to be undone. People are having to work more than 40 hours a week, many for wages that just won't support a family of four anymore.